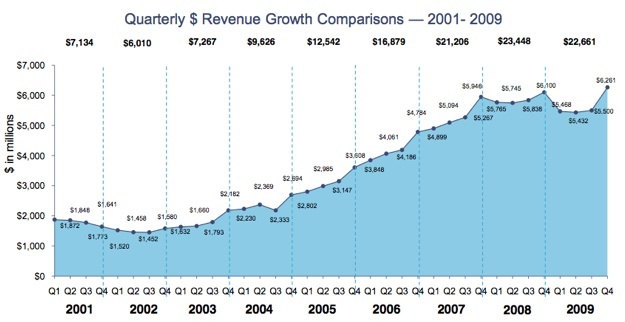 The online advertising industry climbed out of last year’s recession in the fourth quarter. New data from the Interactive Advertising Bureau and PriceWaterhouseCoopers shows that online advertising revenues in the U.S. climbed 2.6 percent annually in the fourth quarter to $6.3 billion, and were up 13.8 percent from the previous quarter. These U.S.-only numbers compare to 10.2 percent annual worldwide growth last quarter in Internet advertising revenues for the four largest Web companies. Industry revenues for the year as a whole were down 3.4 percent to $22.7 billion. It was the first year of declining revenues since 2001. 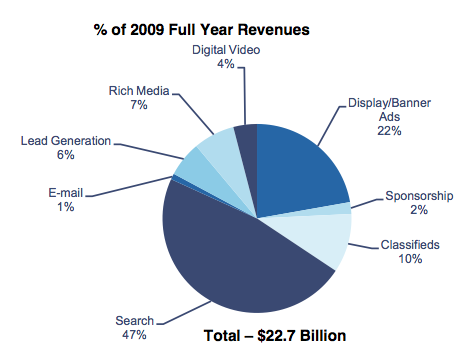 Search and Display revenues both managed to grow for the year, up 1 percent and 4 percent, respectively. The other categories were all down between 14 and 29 percent. Some of the surprising relative strength of Display advertising came from video ads, which reached $1 billion and accounted for 4 percent of the total. In the fourth quarter, video ads made up 5 percent of the pie.